Objective We assessed the frequency and characteristics of ring-enhancing spinal cord lesions in neuromyelitis optica spectrum disorder (NMOSD) myelitis and myelitis of other cause. Methods We reviewed spinal cord MRIs for ring-enhancing lesions from 284 aquaporin-4 (AQP4)-IgG seropositive patients at Mayo Clinic from 1996 to 2014. Inclusion criteria were as follows: (1) AQP4-IgG seropositivity, (2) myelitis attack and (3) MRI spinal cord demonstrating ring-enhancement. We identified two groups of control patients with: (1) longitudinally extensive myelopathy of other cause (n=66) and (2) myelitis in the context of a concurrent or subsequent diagnosis of multiple sclerosis (MS) from a population-based cohort (n=30). Results Ring-enhancement was detected in 50 of 156 (32%) myelitis episodes in 41 patients (83% single; 17% multiple attacks). Ring-enhancement was noted on sagittal and axial images in 36 of 43 (84%) ring enhancing myelitis episodes and extended a median of two vertebral segments (range, 1–12); in 21 of 48 (44%) ring enhancing myelitis episodes, the ring extended greater than or equal to three vertebrae. Ring-enhancement was accompanied by longitudinally extensive (greater than or equal to three vertebral segments) T2-hyperintensity in 44 of 50 (88%) ring enhancing myelitis episodes. 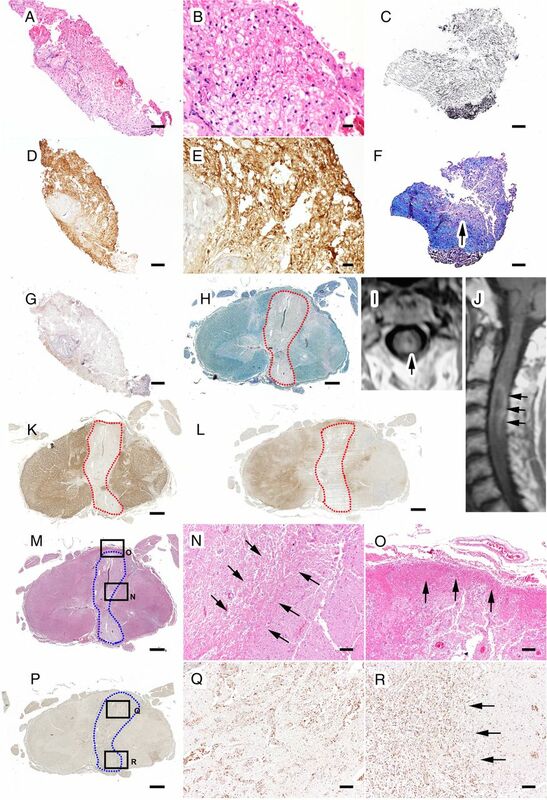 One case of a spinal cord biopsy during ring-enhancing myelitis revealed tissue vacuolation and loss of AQP4 immunoreactivity with preserved axons. The clinical characteristics of ring-enhancing myelitis episodes did not differ from non-ring-enhancing episodes. Ring-enhancing spinal cord lesions were more common in NMOSD than other causes of longitudinally extensive myelopathy (50/156 (32%) vs 0/66 (0%); p≤0.001) but did not differ between NMOSD and MS (50/156 (32%) vs 6/30 (20%); p=0.20). Conclusions Spinal cord ring-enhancement accompanies one-third of NMOSD myelitis episodes and distinguishes NMOSD from other causes of longitudinally extensive myelopathies but not from MS.
Neuromyelitis optica spectrum disorder (NMOSD) is an autoimmune inflammatory neurological disease that targets astrocytes. Longitudinally extensive transverse myelitis (LETM) and optic neuritis dominate the clinical presentation in most patients.1 Since the discovery of the pathogenic autoantibody, aquaporin-4 (AQP4)-IgG, a growing spectrum of clinical findings associated with this antibody has been described.2 Myelitis episodes in NMOSD are commonly severe and recovery incomplete when compared with multiple sclerosis (MS). Recognition of NMOSD as the cause of myelitis is important given the frequently poor outcome and commonly favourable results after intravenous corticosteroids and plasma exchange (PLEX), with a recent study highlighting the benefit of PLEX as initial therapy for myelitis attacks.3–5 Furthermore, early diagnosis indicates a need for maintenance immunotherapy to prevent further attacks.1 MRI characteristics of NMOSD can be helpful in guiding the clinician towards the correct diagnosis.6 In addition to the well-known imaging finding of LETM,7 other MRI spinal cord features that are well established in NMOSD include rostral extension of lesions to the area postrema,8 cord expansion or swelling sometimes leading to concern about spinal cord tumour,7 ,9 T1-hypointensity,10 centrally located axial T2-hyperintensity6 and T2-hyperintense bright spotty lesions that appear syrinx-like.11 ,12 An additional characteristic finding is a longitudinally extensive segment of cord atrophy that supports a previous attack of NMOSD myelitis.13–15 Although LETM is characteristic, myelitis episodes in NMOSD may be associated with lesions <3 vertebral segments in ∼14%.16 While ‘cloud-like enhancement’ and ‘pencil-thin ependymal enhancement’ have been described in NMOSD brain lesions,17 ,18 the gadolinium enhancement pattern of myelitis lesions in NMOSD is less well characterised.5 A limited number of cases with ring-enhancement in NMOSD myelitis have been described previously.19 ,20 We have encountered many ring-enhancing lesions accompanying myelitis in NMOSD and thus sought to better define the ring characteristics and compare the frequency of this finding in NMOSD with myelopathy of other cause. The study was approved by the institutional review board of Mayo Clinic, Rochester, Minnesota. All patients in our study consented to the use of their medical record for research purposes. All incident myelitis cases in the Olmsted county21 population-based database of inflammatory demyelinating diseases (n=30) from 2003 to 2011 who concurrently or subsequently met 2011 diagnostic criteria for MS were studied.22 Ascertainment of these patients using the Rochester epidemiology project medical records linkage system has been described previously.21 The 30 MS myelitis attacks involved the cervical cord (n=14 (46.5%)), thoracic cord (n=11 (36.5%)) or both (n=5 (17%)). Twenty-eight were tested for AQP4-IgG and all were seronegative. Patients with longitudinally extensive myelopathy (greater than equal to three vertebral segments) (n=66) were identified from a database of longitudinally extensive transverse myelopathy evaluated at Mayo Clinic; each patient had a confirmed alternative diagnosis; some were included in prior studies.20 ,23 ,24 This control group included patients with spinal cord sarcoidosis (n=34), spondylotic myelopathy with enhancement (n=16), dural arteriovenous fistula (n=10), spinal cord infarction (n=3) and paraneoplastic myelopathy (n=3). Thirty-eight of these controls were tested for AQP4-IgG and all were seronegative. In those not tested for AQP4-IgG (n=28), the diagnoses were: sarcoid (n=12, all pathologically confirmed), spondylosis (n=9, all had a progressive myelopathy with subsequent clinical and radiologic improvement after surgery), dural arteriovenous fistula (n=6, all confirmed by formal spinal angiogram) and paraneoplastic (n=1, confirmed amphiphysin-IgG seropositive). Imaging was performed at our facility on a mixture of mostly 1.5T and a minority of 3T MRI Siemens and GE machines. Gadolinium was administered as Gadovist (gadobutrol) 0.1 mmol/kg IV. Imaging was done without delay following the Gadovist, with no delayed imaging sequences performed to look specifically for late enhancement. Cervical spine imaging was performed as follows: (1) T2—TE 107 ms, TR 2600–600, slice thickness 4 mm, interspace 0 mm; (2) T1—TE 11, TR 510, slice thickness 3.5 mm, interspace 1.5 mm; and (3) IR—TE 74, TR 3500, TI 110, slice thickness 3.5 mm, interspace 0.5 mm. Thoracic spine imaging was performed as follows: (1) T2—TE 105, TR 2600–6000, slice thickness 3.5 mm, skip 0.5; and (2) T1—TE 9.4, TR 400–700, slice thickness 3.5 mm. Lumbar spine imaging was performed as follows: (1) T2 with fat saturation TE 105, TR 2600–6000, slice thickness 4, skip 1; and (2) T1—TE 9.4, TR 400–700, slice thickness 4, skip 1. Fat saturation was available for postgadolinium imaging at the discretion of the protocoling radiologist. Outside images that were included in our study were variable in parameters and had unknown protocols. The pathology specimen was reviewed by CFL and YG. Comparisons were performed using Wilcoxon rank sum test or Fisher exact test using SAS JMP V.8.0 software. Gadolinium enhancement was demonstrated in 147 of 156 (94%) myelitis attacks and 50 of 156 (32%) total myelitis attacks had ring-enhancement (table 1). Ring-enhancing lesions were located in the cervical spinal cord in 16 of 50 (32%) attacks (table 2), in the thoracic cord in 29 of 50 (58%) attacks and cervicothoracic cord in 5 of 50 (10%) attacks. The ring-enhancing pattern was present on sagittal and axial images in 36 of 43 (84%), on sagittal images alone in 4 of 43 (9%), and on axial images alone in 3 of 43 (7%) attacks in which sagittal and axial views were available (figure 2). The attacks had open rings (on sagittal, axial or both sequences) in 41 of 50 cases (82%). Ring-enhancement extended a median of two segments (range, 1–12); 21 of 48 (44%) had a ring that extended three or more vertebral segments which often had an elongated ‘cat's eye’ or lens-shaped appearance (figure 2C). The median ratio of the length of a ring-enhancing lesion to the corresponding T2 hyperintense lesion was 0.56:1 (range 0.14:1 to 1:1). Both complete ring-enhancing lesions (figure 2A–C) and open rings were encountered (figure 3J). There were no patients with multiple concurrent ring-enhancing lesions in the spinal cord or brain. Ring-enhancement was accompanied by the following other MRI features: longitudinally extensive (greater than or equal to three vertebral segments) T2-hyperintensity in 44 of 50 (88%); pregadolinium T1-hypointensity in 22 of 50 (44%) cases and T2 bright spotty lesions in 13 of 50 (26%). In some images, the enhancement encased a focal bright spotty T2-hyperintense lesion forming a ring around that lesion (figure 2A2 and A4). Ring-enhancement was not accompanied by pregadolinium T1-hyperintensities or T2-hypointensities. In those attacks in which treatment details were documented, 102 of 119 (86%) MRIs had been performed prior to attack treatment (PLEX or intravenous methylprednisolone) and this proportion did not differ between those with or without ring-enhancement (93% vs 82%; p=0.17). There were insufficient clinical details of response to attack-therapy to compare this between these two groups. Serial imaging within 90 days was available in 15 attacks; resolution of contrast enhancement occurred within 1 month in seven of the 15 attacks (47%). Notably, 2 of these 15 attacks (13%) showed contrast resolution as soon as 1 week from attack onset and 3 others (20%) showed resolution within 2 weeks. All patients with serial imaging had received IV corticosteroids and eight received PLEX treatments before subsequent imaging, thus likely contributing to contrast resolution. Ring-enhancing myelitis in neuromyelitis optica spectrum disorder. A longitudinally extensive T2-hyperintensity (A1) with a bright spotty T2-lesion is evident on sagittal (A1, arrow) and axial (A2) T2-weighted sequences and is accompanied by a ring of enhancement (A3, A4: arrow) on T1-weighted postgadolinium sequences which encompasses the bright spotty T2-lesion. A ring-enhancing lesion extending two vertebral segments on sagittal sequences (B1) is also evident on axial sequences (B2). A ring-enhancing lesion extending over greater than three vertebral segments on sagittal sequences is also shown (C). All three form an elongated lens-shaped ring on sagittal sequences resembling a cat's eye. Panel B Reprinted with permission from Flanagan EP et al. Mayo Clin Proc. 2013 Nov;88(11):1204–12. doi: 10.1016/j.mayocp.2013.07.019. Pathology from a patient with neuromyelitis optica with a ring-enhancing spinal cord lesion. Spinal cord biopsy at the time of the MRI ring-enhancing lesion reveals vacuolated tissue with areas of preserved myelin (A/B: H&E; D/E: Proteolipid protein (PLP) immunocytochemistry). In some regions, focal demyelination with relative axonal preservation is evident (C: Bielschowsky; F: Luxol fast blue/Periodic Acid-Schiff (LFB)/PAS). Aquaporin-4 (AQP4) immunoreactivity is lost (G: AQP4 immunocytochemistry). Spinal cord autopsy performed 11 months after MRI demonstrates scattered demyelinating lesions (H: LFB/PAS). Axial (I) and sagittal (J) views of the spinal cord MRI show the ring-enhancing lesion corresponds to an outlined (dotted red line) area of demyelination (H: LFB/PAS; K: PLP immunocytochemistry) associated with loss of AQP4 immunoreactivity (L: AQP4 immunocytochemistry). The border of the lesion (M box inserts; H&E) corresponds to regions of pronounced gliosis (N/O: H&E). (P/Q) Macrophages are distributed throughout the lesion, without obvious accumulation at the lesion border (R: anti-macrophage antibodies (KiM1P) immunocytochemistry). One patient underwent a spinal cord biopsy at age 67 at the time of a ring-enhancing lesion. The patient subsequently died 11 months later (exact cause of death unknown) and had an autopsy performed. The spinal cord biopsy revealed tissue vacuolation, demyelination and loss of AQP4 immunoreactivity but preserved axons (figure 3). Subsequent autopsy revealed a lesion at the site of this episode with pronounced gliosis at the lesion edge (figure 3). The frequency of ring-enhancement in NMOSD did not differ from that in a population-based cohort of incident MS myelitis cases (50 of 156 (32%) vs 6 of 30 (20%); p=0.20). Gadolinium enhancement occurred in 19 of 30 patients (63%) and enhancement occurred in a ring pattern in 6 of 19 (31.6%). All MS ring-enhancing lesions and the corresponding lesion on T2 weighted sagittal sequences extended less than three vertebral segments in length (figure 4F). An example of ring-enhancement in MS is shown in figure 4F. The 30 MS myelitis attacks involved the cervical cord (n=14 (46.5%)), thoracic cord (n=11 (36.5%)) or both (n=5 (17%)). In comparison, the 156 NMOSD myelitis attacks involved the cervical cord (n=35 (22.4%)), thoracic cord (n=48 (30.8%)) or both (n=73 (46.8%)). 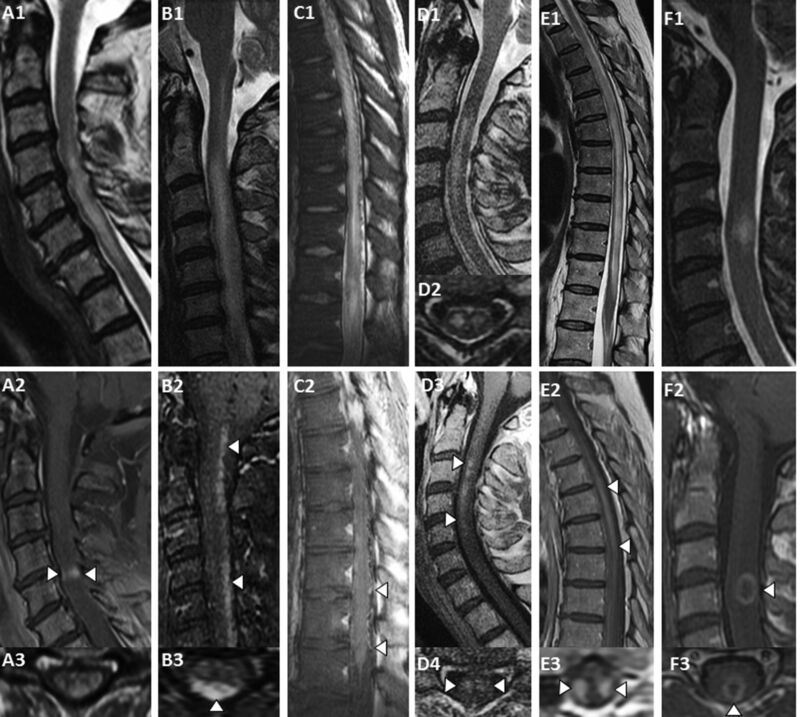 MRI T2-signal and gadolinium enhancement patterns in control myelopathy cases. Longitudinally extensive T2-hyperintense (A1–E1) and a short T2-hyperintense (F1) lesion are shown. The postgadolinium images show how the pattern of enhancement can help suggest the underlying aetiology: (A) transverse band or pancake-like enhancement in which the width is greater than or equal the height (A2, arrowheads) sparing grey matter on axial images (A3) in a patient with spondylotic myelopathy with enhancement;24 (B) linear dorsal subpial enhancement (B2, B3: arrowheads) in a patient with spinal cord sarcoidosis;20 (C) enhancing veins surrounding the cord (C2, arrowheads) in a patient with dural arteriovenous fistula;38 (D) linear enhancement of the anterior spinal cord (D3) involves the anterior horn cells on axial postgadolinium images, that is better exhibited on the axial T2-weighted sequences where it forms an owl eye pattern (D2) in a patient with spinal cord infarction;39 (E) diffuse rostro-caudal gadolinium enhancement (E2, arrowheads) is shown on axial sequences to be restricted to the lateral columns (E3, arrowheads) in a patient with paraneoplastic myelopathy.23 A ring-enhancing lesion is shown on sagittal and axial sequences (F2, F3: arrowheads) in a patient with multiple sclerosis27 and is more circular on sagittal sequences than that of NMOSD, which is often lens-shaped. The frequency of ring-enhancing spinal cord lesions was higher with NMOSD (50 of 156 (32%)) than with other aetiologies of longitudinally extensive myelopathy (0 of 66 (0%); p<0.001). 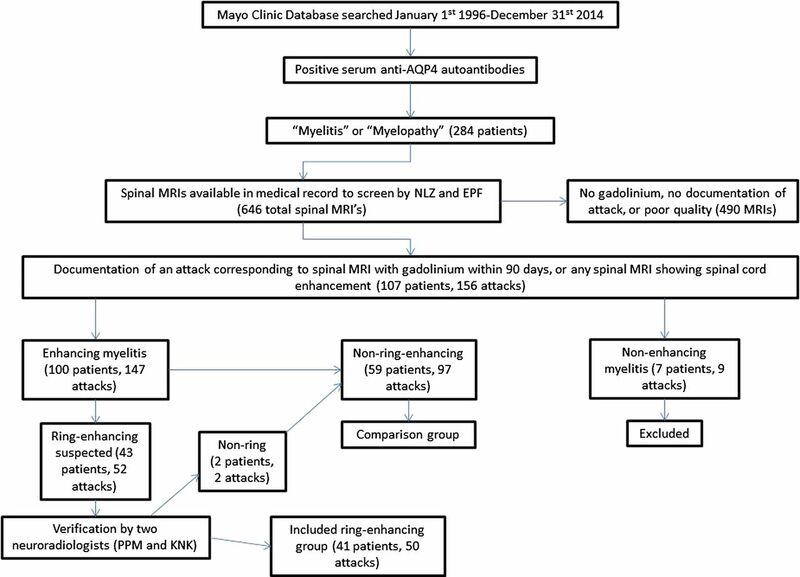 Gadolinium enhancement was demonstrated in 65 of 66 control long myelopathy patients (98%). Examples of control long myelopathy cases are shown in figure 4A–E. Spinal cord ring-enhancing lesions are a common radiologic accompaniment of NMOSD occurring in 32% of cases. The presence of ring-enhancement distinguished NMOSD from other causes of longitudinally extensive myelopathy but on its own did not distinguish NMOSD from MS. There was no difference in the clinical characteristics or therapy response of patients with ring versus non-ring-enhancing myelitis (table 1). The ring-enhancing spinal cord lesions in our patients with NMOSD were distinct, with a characteristic lens-shaped or ‘cat's-eye’ appearance (figure 2A3, B1, C) often encasing a bright spotty T2-lesion (figure 2A). Sometimes the rings were non-uniform and had shaggy borders (eg, figure 2B1 showing a thicker posterior than anterior border) or were incomplete giving an open-ring appearance on sagittal sequences (figure 3J). Ring-enhancing spinal cord lesions have also been reported in MS at a frequency of 6.2%.27 The higher frequency of ring-enhancing lesions in this study (20%) may result from the high proportion of scans that were obtained at the time of acute symptoms compared with other studies.27 In 44% of NMOSD myelitis, the ring-enhancement extended over greater than or equal to three vertebral segments (figure 2C), in contrast to the much shorter lesions in MS. Even when ring-enhancing lesions in NMOSD extend less than three vertebral segments (figure 2A3, B1), the accompanying longitudinally extensive T2-lesion in most cases (88%) allows distinction from MS. The comparison group from our longitudinally extensive myelopathy database included the most commonly identified causes of longitudinally extensive myelopathy at our institution, but did not include certain causes of myelopathy (eg, cysticercosis, tuberculosis or abscess)28–31 nor primary spinal cord tumours (eg, astrocytoma),32 in which rare case reports of spinal cord ring-enhancement exist. The characteristics of the ring (lens-shaped and longitudinally extensive in NMOSD vs short and ovoid with abscesses) and course (subacute presentation in NMOSD vs insidious and gradually progressive course with spinal cord intramedullary tumours) are useful in differential diagnosis. With intramedullary spinal cord metastases, a specific finding of a thin rim of enhancement encasing a less intensely enhancing lesion frequently accompanied by a flame-shaped region of enhancement at the inferior or superior aspect differs from the pattern observed in our study.33 As most other ring-enhancing spinal cord lesions have a closed ring, the open-ring appearance, when present (figure 3J), may help distinguish from infections and tumours. However, open ring-enhancement has been described in MS as well.34 Also, contrary to the expected course of spinal cord malignancies and abscesses, a high proportion of our patients with NMOSD demonstrated resolution of contrast enhancement within a relatively short time (47% within 1 month). Therefore, repeat MRI to document resolution of enhancement may be helpful, as NMOSD would be more likely than a tumour or infection in this circumstance. Our study has several limitations due to its retrospective design: there was no standardisation of MRI protocol or MRI quality given different machines used from different facilities; many patients had to be excluded due to inadequate documentation of attacks and a lack of postgadolinium images on spinal MRI; only a minority of patients had serial imaging available; and treatment in relation to MRI scan was heterogeneous among our population. An additional limitation was that some controls were not tested for AQP4-IgG. However, in all control cases, the diagnosis was either confirmed pathologically (sarcoid), radiologically (spinal angiogram for dural arteriovenous fistula), serologically (positive paraneoplastic autoantibody) or in the case of spondylotic myelopathy, the course (progressive myelopathy) and treatment response (improvement and/or resolution after decompressive surgery) were not consistent with NMOSD. This made it extremely unlikely that any of the controls not tested for AQP4-IgG would have been seropositive. Spinal cord ring-enhancement is a common radiologic finding in NMOSD and distinguishes NMOSD from other causes of longitudinally extensive myelopathy but not from MS.
. Discriminating long myelitis of neuromyelitis optica from sarcoidosis. Ann Neurol 2015;79:437–47.
. Ring-enhancing lesions in the brain and spinal cord. BMJ Case Rep 2013;2013:pii: bcr2013009540. Contributors NLZ is the lead author and was involved in data acquisition. PPM contributed to radiographic data review. BGW was involved in critical revision of manuscript. CFL conducted pathology review and critically revised the manuscript. YG was involved in pathology review. SJP critically revised the manuscript. KNK reviewed radiographic data. TJK, DMW and NK critically revised the manuscript. EPF contributed to study and concept design, analysis and interpretation, and critically revised the manuscript. Competing interests NLZ, PPM, NK, EPF, YG and KNK have no disclosures. BGW receives royalties from RSR and Oxford University for technology licence for AQP4 autoantibodies used for diagnosis of neuromyelitis optica. He serves on data safety monitoring committees for Novartis, Biogen-Idec and Mitsubishi pharmaceutical companies, and serves on an adjudication panel for MedImmune Pharmaceuticals. He served as a consultant for GlaxoSmithKline, Elan, Ono, Chugai and Alexion and Novartis pharmaceutical companies. He serves on editorial boards for Neurology, the Canadian Journal of Neurological Sciences and Turkish Journal of Neurology. CFL shares in royalties from marketing of kits for detecting AQP4 autoantibody and from the sale of Blue Books of Neurology: Multiple Sclerosis 3 (Saunders Elsevier, 2010); she receives research support from Biogen, Novartis, Alexion, and Sanofi. SJP is a named inventor on patents (#12/678,350 filed 2010 and #12/573,942 filed 2008) that relate to functional AQP4/NMO-IgG assays and NMO-IgG as a cancer marker; receives research support from Alexion Pharmaceuticals, the Guthy-Jackson Charitable Foundation and the National Institutes of Health (NS065829). SJP has provided consultation to Alexion Pharmaceuticals, MedImmune LLC and Chugai Pharma but has received no personal fees or personal compensation for these consulting activities. All compensation for consulting activities is paid directly to Mayo Clinic. TJK is a consultant for SpineThera. DMW has received research support from Alexion, Terumo BCT and the Guthy-Jackson Charitable Foundation, receives financial compensation for participation on a relapse adjudication panel for MedImmune, has served as a consultant to Alexion, MedImmune and Chugai Pharmaceuticals, and has served as co-Editor-in-Chief of The Neurologist. Ethics approval Institutional Review Board of Mayo Clinic, Rochester, Minnesota.